1. I came across a spoiler by someone who watched the first episode of season 4 during SWC....its quite interesting. - Sabine gets out of a trench, raises her Darksaber to signal the assault. - Ezra fumbles around with his jetpack. - Kanan uses airborne enemies as stepping stones. - Sabine kicks a** until she gets stunned. - Imperial Mandos call for surrender, everyone stops fighting. - Reinforcements arrive to free Sabine. - The Rebels/Mandos free the compound only to find that Sabine's dad isn't there. - Governor Saxon (not Gar) has ordered his immediate public execution. - Bo Katan, who led the reinforcements, formally introduces herself. - Sabine offers to let BK rulers the rightful heir; she declines. - Kanan gives Hera a status report; exchange has romantic undertones. - Ezra asks Sabine about Mandalore; she laments the planet being ruined by constant warfare. - Sabine's bro and mom arrive and let her know about where her dad is headed. - The Rebels/Mandos intercept the convoy. - Sabine paint-bombs the front of the convoy where her dad is being held for ID purposes; she also uses a moving speeder bike as cover before she hijacks it. - Ezra gets under a transport and slices through it. - Kanan jumps into another on and Force-Throws everyone out. - Chopper straight-up pistol-whips an Imperial while jetting forward. - BK does some cool stuff that I don't remember with the main group, while Sabine's family is leading an assault elsewhere. - Ezra jets in to rescue Sabine's dad, gives him the jetpack so he can get out. - Convoy careens off of cliff while Ezra uses his ability to jump good to make it there; Sabine saves him when his grip slips. - Sabine and her dad reunite, have a conversation about artistic technobabble. - Gov. Saxon orders a retreat, but the Duchess of Mandalore (Rook Kast?) offers a single reinforcement inside an AT-DP; Sabine immediately recognizes what this is and warns Tristan and Ursa to get out of there. - Everyone reacts in horror as Sabine discovers what has happened, mourning the loss of her family and their allies alike. - Sabine's father recognizes the blast as being a result of one of the weapons Sabine built; a cruel insult from the Duchess. 2. 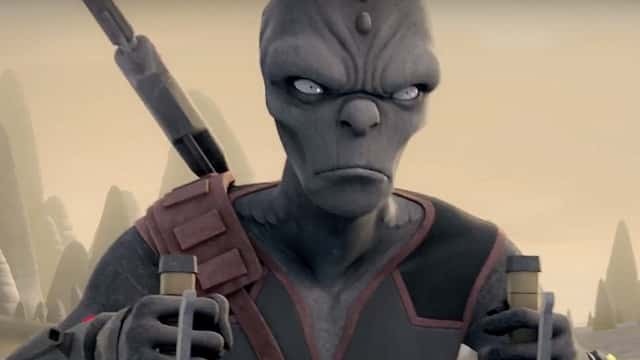 Warwick Davis is playing Rukh, the Noghri bodyguard of Thrawn....so another legends character comes into canon. 3. 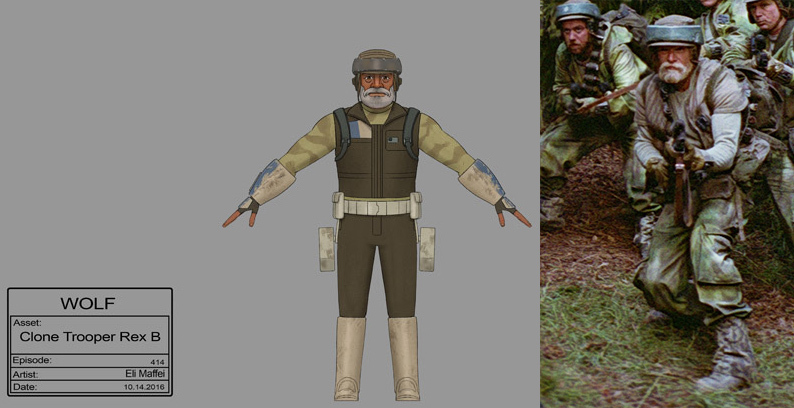 Rex might be the old pathfinder rebel in ROTJ on Endor based on his Season 4 costume. 4. Ahsoka lives (in some form or the other) based on a hint given by Dave Filoni's t-shirt change. And I missed that panel At least, I got an autograph from Hera's voice. Just watched the trailer for Season 4. OMG. Why do we have to wait so long? And then the wolf that Ezra is riding (with Sabine!) and that Kanan is greeting. And Kallus looking like a resistant. Where are they btw? It looks like the place Doctor Aphra went to with her father in one of the eponymous comic books, no? @SanghaRen wrote: And I missed that panel At least, I got an autograph from Hera's voice. That scene of Kanan and Hera is just beautiful and moving.... I have this bad feeling their romance is no going to end well but I still have this headcanon that they quit the resistance after the battle of Scarif, go settle on some distant planet and have hybrid babies. 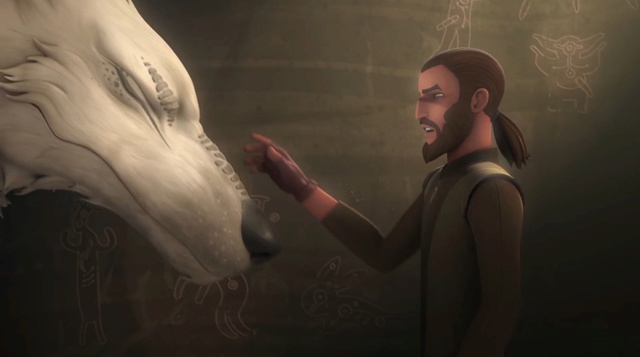 There is speculation that the wolf is Ahsoka... I have read something about shapes-hifting in the EU....need to re-read it since it might be canon now....am not sure about this but didn't Sabine look like she was half collapsing on the wolf and was being held up by Ezra? I also noticed some sort of box in front of them...wonder if it is some weapon? The resistance is now on the base at Yavin IV (you're right- that is where Aphra and her Dad figured out how to locate the Ordu Aspectu....did you read the final comic of the series? It is crazy. )....this is where the resistance were operating during RO and ANH...so we're fast approaching that time period. Kallu looks really good...I love how the panel made jokes about the romance between Zeb and Kallu and how he was now 'Hot Kallus'. I haven't watched the panel yet. Funny, but when you're there, you actually get less information and have to catch up. Yes, Sabine does look hurt and there is indeed something in front of her. I haven't read the last Aphra yet. Another thing to do. I also downloaded Thrawn, but haven't started to read it. I just wonder when I will find the time since I go back to work tomorrow after more than 2 weeks of absence. I am so bad with recognizing planets and knowing their names. At least I noticed it was a familiar planet and where I saw it. I am high fiving myself for this. I refuse to believe they'll give a bad end to Hera and Kanan. Ain't happening. Hybrid baby there will be and he/she will be briefly shown as a pilot in TLJ. It's my head canon. @panki wrote: 1. I came across a spoiler by someone who watched the first episode of season 4 during SWC....its quite interesting. RUKH IS BACK!!!! AHHHHHH YES!!!!! Well we all know how this will end now, . If you've read The Thrawn Trilogy, you'll know what I'm talking about. I wonder if his relationship with Thrawn will be similar to how it was in Legends and if the Noghiri's species and role and their how they uphold their honor and loyalties will also be similar. I would love it if Khabarakh came back and was the foil to Rukh, similar to how it was in the Thrawn Trilogy. His relationship with Leia was one of my favourite aspects. Am really happy about this myself.... My only worry is how they will approach the Leia-Noghri relationship considering they can't exactly call her Lady Vader at this point of time.... Maybe they will either bring in some Noghri- Bail Organa connection or give Hera the role Leia had in the EU? @panki wrote: Am really happy about this myself.... My only worry is how they will approach the Leia-Noghri relationship considering they can't exactly call her Lady Vader at this point of time.... Maybe they will either bring in some Noghri- Bail Organa connection or give Hera the role Leia had in the EU? @panki I don't think they will. As you know, the Noghri were only loyal to Thrawn because they were loyal to Vader. They saw Vader as the saviour of their species, culture and planet thus only served the Empire because it was his will, not the Emperor's. They only followed Thrawn because he was the only one keeping Vader's "will" alive due to trying to keep the Empire alive. Once they discovered Leia was his daughter and true heir, as well as realise how Thrawn was secretly killing their planet and effectively keeping them as slaves and disregarding their honor, they rightfully turned on him and followed Leia. @panki also do you think that is Sabine's helmet in her arms? Because it looks kind of too yellow to be her helmet? Idk it doesn't look like ursa's design though. Maybe it's just the lighting playing tricks with my eyes. That whole shot is so mysterious. Sabine does look limp. so happy this show is over. Now make a decent show, not this crap that so many fans hate (except for Sabine). Let's keep it positive please. As you can see, there are plenty of people here who enjoy this show. @IoJovi wrote: Let's keep it positive please. As you can see, there are plenty of people here who enjoy this show. I'm super positive that it's over. They have 4 seasons to enjoy and I'm gonna enjoy the fact that it's over and won't have to listen about it anymore. @vaderito wrote: so happy this show is over. Now make a decent show, not this crap that so many fans hate (except for Sabine). If you have nothing nice to say and are legit just trying to bait/upset people or impose your "superiority" for not liking this "crap" you should probably refrain from saying it at all. I'm just happy that when it's over podcasts won't have to bring it up anymore. That's the part that I always skip through to get to something relevant. I like Rebels! It has delved into some interesting areas and brought some great characters into the Star Wars universe. I don't think it's at all irrelevant. In fact, I would say it's extremely relevant to the direction of the ST, especially in regards to the understanding of the force, the Jedi and non-affiliated force users. Like The Clone Wars before it, it has enhanced the canon IMO. I can't remember anything about Rukh. The name sounds familiar, but I read the books a long time ago. I made a search through the Thrawn book and there is no mention of Rukh or even the Noghri. Maybe the timing of Thrawn is set before he gets Rukh as a bodyguard. I just watched the panel. Some random comments and thoughts. - Hot Kallus is fun. It's hilarious that Dave Filoni was not really aware of what the crew was doing with that strand of hair which caused such a response from the audience. In general, I think it's kind of funny that we can find original animated characters attractive. They might be inspired by real people, but they are still pretty much creations and not animated adaptations of real persons. I like Kanan partly because of his looks and even more since he started sporting a beard. How weird is that? - Now it's my turn to be scared for Kanan. Don't go and pull an OB1 on us now! - Let's wait and see, but I would have loved Rae Sloane to make an appearance. I am still a bit annoyed that they had this character looking like her in one episode. She is Kanan and Hera's enemy and is popular so would have been cool to see her make an appearance. Oh, well. - I was happy to hear FPJ talk about that moment when Kanan tells Ezra he has nothing to teach him anymore and Ezra answers that he still has a lot to learn from him about life. I was not too fond of Ezra at the beginning of the show but I really like how he evolved in Season 3 and I loved that moment because they both have so much respect for each other even though both know that Ezra is a stronger Force user. It's a great example of what a teacher-student relationship should be. - So seems like Chopper will save the day! Hopefully he'll do so in one piece. We all already know he has a bigger heart than many humans. @jakkusun wrote: @panki also do you think that is Sabine's helmet in her arms? Because it looks kind of too yellow to be her helmet? Idk it doesn't look like ursa's design though. Maybe it's just the lighting playing tricks with my eyes. That whole shot is so mysterious. Sabine does look limp. I think they can retcon the story completely (like they have in the case of Thrawn's Ysalmiri, relationship with Anakin and Pellion) but leave elements of the EU story so fans can say - Ah, I see the connection....but yet get a new story. My thinking is this- if it is too soon to show a relationship between Vader and the Noghri, they can always show Cham Syndulla being the one who the Noghri felt a sense of gratitude towards (maybe he gave them a home on Ryloth when theirs was poisoned?) ...in this way, they can retain the gratitude towards a saviour father being passed to the daughter. @panki I was thinking this as well! I can definitely see this happening! I really like Rebels, but I feel like it has a lot of the growing pains everybody feared the entire franchise was going to suffer after the Disney takeover. Especially with Ezra being the 'kid insert' character, he flip flops a lot with his characterization for the sake of that. This final season might get better with that. I hope the next series won't suffer from that, I think a kids series can exist without a character that has to be a kid insert. It's another reason I always doubted Rebels would go as dark as CW, it skims the edge, but never delves in. Again, they might get more gutsy with the final season. I'm excited for it and whatever animated series we get next. I do like shows like Rebels and CW for that world building and the new characters. @Helix wrote: I really like Rebels, but I feel like it has a lot of the growing pains everybody feared the entire franchise was going to suffer after the Disney takeover. Especially with Ezra being the 'kid insert' character, he flip flops a lot with his characterization for the sake of that. This final season might get better with that. I hope the next series won't suffer from that, I think a kids series can exist without a character that has to be a kid insert. It's another reason I always doubted Rebels would go as dark as CW, it skims the edge, but never delves in. Again, they might get more gutsy with the final season. I'm excited for it and whatever animated series we get next. I am part of the people who never expected Rebels to go really dark. To me it is a family cartoon and I am not quite sure why so many people seem to think Star Wars stuff has to always go dark nowadays. Each episode has the typical structure of a show for children with a lesson to be learned by a character. Dave Filoni visibly does not feel like changing the tone and prefers to end it as it started, as a family show with some darker undertones. I didn't like Ezra much in the first 2 seasons and I am also one of the rare people who actually... *lowers her voice* does not like Sabine much. I don't hate her, but I feel no connection. She just feels too adult and too courageous and too... Well too much of everything. But the beauty of SWR is that each character is different enough that everyone gets to like a character. To me SWR is a show with heart. It's pretty much like TFA : I see flaws but I still love it and want to know what happens next with great expectation. - I've just got the Thrawn book but have yet to read it....maybe we'll find out how Thrawn was assigned Noghri bodyguard(s) during Rebels. - As for Aphra... I LOVE the fact that they made her like women (this was introduced organically and didn't feel like it was forced for fan service)....but I have this feeling that she, like Sana, is bi (so she might end up flirting with Luke in the upcoming series)... I have a feeling her character is inspired by the rebellious female playwright in RL Aphra Behn, who had relationships with men and women....but even if she is only into women, I'm more than okay with it. 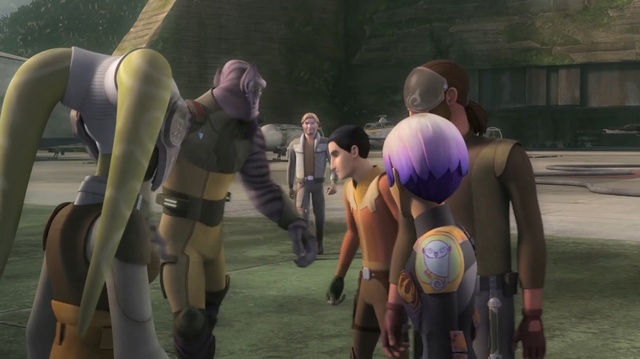 - Hehe...the 'hot Kallus' references were hilarious (being a Kalluzeb shipper myself)! I like Kallus's new rebel look and Kanan is handsome in his blind samurai avatar. - I have this feeling either Ezra or Kanan will survive the series...my bet is on Ezra as of now...speaking of the dark side, I wonder what happened to the sith holocron and whether we'll ever find out about the identity of the presence in it? - You could still get your wish about seeing Rae Sloane, especially since it has been confirmed that Hera survives the battle of Endor (she has an adventure on Endor with Han and Leia after the DS blows up in an upcoming story)...maybe Rae Sloane and Hera will have some confrontation pre-Endor? - I wonder if we'll see Chopper in some ST stories? I've always loved stories where they explore what it means to be human and whether droids have a soul or are capable of using the force. I could see Aphra being bi. I love stories about robots/droids showing human traits too! I get so annoyed when they are dismissed as soulless because who's to say who deserves a soul or not. It's so arrogant to believe that as a human, you have a soul, and other beings don't. I never thought about a droid using the force. That is an excellent idea to explore! So let's make it challenging and see who will finish reading Thrawn first I already know you will win, but I'll give it my best. Another Kalluzeb shipper! I thought we were only in certain sectors of the fandom. @panki I also thought it might be Tristan's helmet maybe. Idk the thought of it not being Sabine's helmet makes me nervous. Who knows. And hey yeah it is a lot like Finn and rose on the space horse! I guess I'm worried that because kanan is talking about balance, that the "balance" mentioned in the TLJ trailer doesn't mean what we hope it means(a reconciliation of light and dark or something with Rey and Kylo, you know, something new?). But maybe kanan and Ezra will move toward more of a middle ground. Idk. I really like your ideas I'm just worried they aren't what's actually going to happen, I guess. @AppleCrumble122 haha rukh's design also totally made me think of gollum! I'm glad because the clone wars wasn't totally kid-friendly and I think I prefer things to be more PG just for myself anyway. I'm especially glad the female characters, both the main and background characters, are less sexualized in rebels, tbh. I'm really hoping Rae Sloane shows up, too! Lol.... that is so true....maybe we'll hear a Rukh is Snoke theory in the near future? I've seen quite a few Kalluzeb supporters on tumblr.....been shipping them ever since they got stuck on that planet alone... was happy their pairing was acknowledged in the rebels panel at SWC this year. The idea of a FS droid was explored in SW Tales in the EU, where a R5-D4 unit deliberately sabotages himself so that R2-D2 can be selected by Owen Lars in ANH because the force tells him that R2-D2 must reach the hands of Luke....I think he is popularly known as Skippy the jedi droid. I have a feeling you're going to win our little reading race......normally I take a day or so to finish a book but a lot of RL stuff has come up for me of late so I might take a week or so to finish the book this time around. @jakkusun wrote: @panki I also thought it might be Tristan's helmet maybe. Idk the thought of it not being Sabine's helmet makes me nervous. Who knows. And hey yeah it is a lot like Finn and rose on the space horse! I'm also worried that poor Kanan and Ezra won't discover anything ground breaking because those discoveries are reserved for Skywalkers... But I also am a little hopeful if they're seeking a balance because this would mean they might no longer be jedi and then Yoda's statement could ring true about them being the last jedi even if Kanan and Ezra were still alive.